Rafael Nadal is seeking 100,000 euros ($118,000) in damages from former French sports minister Roselyne Bachelot after she accused the Spanish tennis legend of a dope test cover-up, Owojela’s Blog reports. Nadal is suing Bachelot, who served as sports minister between 2007 and 2010, over remarks in March 2016 on French television. She alleged that Nadal faked an injury in 2012, when he missed the final six months of the season due to knee problems, in order to hide a positive drug test. Neither Nadal nor Bachelot were at the court hearing in Paris on Friday. The player's lawyer, Patrick Maisonneuve, told the court that the doping accusation could have had "major consequences" for Nadal concerning his "existing or future sponsors". Maisonneuve said his client had "asked me to put to bed once and for all what Mrs Bachelot said by passing on to you his medical file" which he said revealed a very serious left knee injury. Bachelot's lawyer Olivier Chappuis argued that at fault was the International Tennis Federation's anti-doping programme, which he claimed "has always been astonishingly lax". He added: "There is a vast gap between the success he enjoys and the weakness of anti-doping controls. "What sponsor has abandoned Rafael Nadal because of these comments? 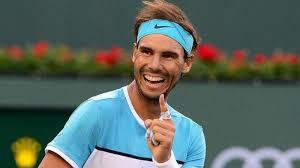 None," he claimed, suggesting the court award symbolic damages to Nadal if his client is found guilty of one euro. The 16-time Grand Slam winner has never failed a drugs test and vehemently denies ever using a banned substance. After Bachelot's accusation, Nadal explained last year why he was taking legal action against her. "I am tired about these things. I let it go a few times in the past. No more." He added that he expected better of a person who was "minister of a big country and a great country like France". "I know how much I did to be where I am, and I know 100 percent my values." A verdict is expected on November 16.